Just like the ATIV S which came before it, the Samsung ATIV SE is a rehash of the South Korean maker's previous Android flagship, the Galaxy S4 in this case, running Windows Phone 8. Even though Windows Phone 8.1 was just announced, the company is sticking to the release dating back to 2012. The ATIV SE, which is only available at Verizon at this stage, is likely to be Samsung's Windows Phone flagship for quite some time, if the ATIV S is of any indication (it was released nearly 18 months ago). Luckily, the hardware does not disappoint. Samsung's new Windows Phone packs a 5.0-inch AMOLED display with a resolution of 1080 by 1920 and Corning's Gorilla Glass 3 on top. The smartphone is powered by a 2.3 GHz quad-core processor, most likely a Qualcomm Snapdragon 800 (that Samsung is using in the Galaxy S4 LTE-A), with 2 GB of RAM and a 2,600 mAh battery that powers it. We have 16 GB of internal storage in the ATIV SE, with a microSD card slot available to extend the capacity by up to 64 GB. That said, until the smartphone is updated to Windows Phone 8.1, the tiled operating system does not allow users to install apps on the microSD card, and that somewhat limits the appeal of the ATIV SE. The ATIV SE comes with 13 MP back-facing and 2 MP front-facing cameras, both of which can record 1080p video. Except for the faster processor, the smartphone is identical to the standard Galaxy S4, that debuted one year ago, up to this point. Another difference lies in connectivity. While the Galaxy S4 came with Bluetooth 3.0, the ATIV SE has to make do with the lesser Bluetooth 3.0. The latter also gets 4G LTE cellular network support, Wi-Fi 802.11 a/b/g/n/ac and the usual remaining features, like GPS. Size-wise, the ATIV SE comes in at 5.42 x 2.75 x 0.33 inches, weighing in at 4.79 ounces. It is a tad longer, thicker and heavier than the Galaxy S4. As in the case of the ATIV S, the available color trim Samsung offers is gray. On top of Windows Phone 8, Samsung bakes in a couple of branded apps, including ChatON, ATIV Beam, Link and WatchON. They are definitely not as large in number as Nokia's exclusive apps are, but they are welcome additions nonetheless. 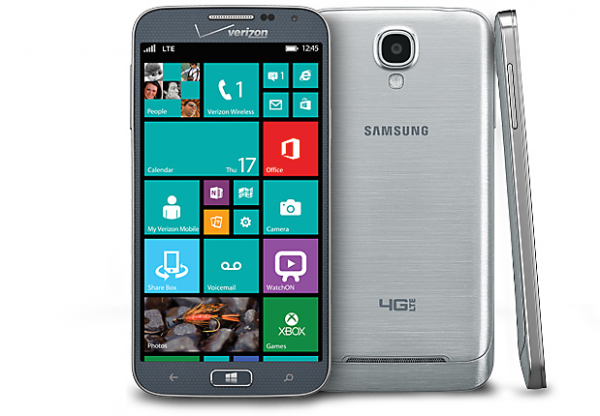 The ATIV SE is currently available on pre-order at Verizon, for $199.99 with a two-year contract. The new Windows Phone can also be had without one, for $599.99. It ships by April 12.